Does anyone remember the Rocking D Jays in the 60s? We used to practise in the church hall, Trimdon Colliery. Our first performance, which was in the church hall earned us £2.12.0 (Two pound and twelve shillings – £2.60). Our first big paid job earned us £10.00 at Leeholme Club – a great night! Trimdon Comrades and The Colliery Club –- plus many more all for a fee of £10. 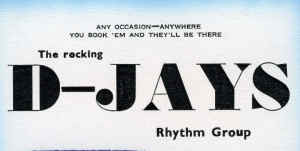 Memories of the D-Jays ! “I remember the Rocking D Jays very well. I never saw them perform but I certainly remember hearing them. 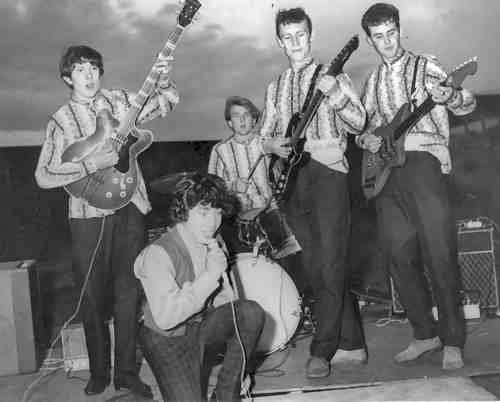 In 1967 we lived in the Welfare Flat, and boy could we hear them rehearsing. They were loud but it sounded good! 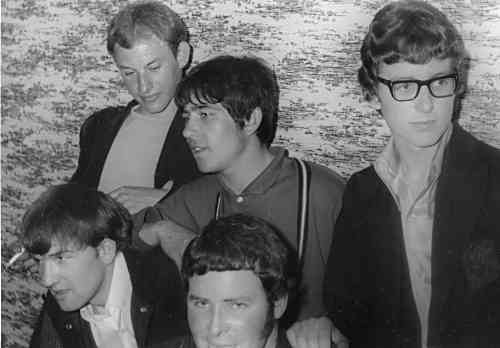 Love the photos.” A.M.
“ I was a friend of the DJays from school days in the 60s and used to travel with them to all of the venues referred to on the web page. A mention about the other lad next to Johnny (wearing the same striped shirt in the 4th picture), he’s Raymond Aire from Trimdon village he used to play the saxophone. 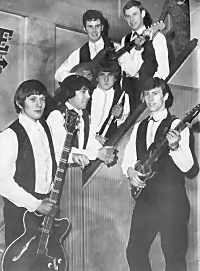 The band started in the early sixties, after a short time Ronnie Davison (rhythm guitar) left the group and went to Australia, (about the same time as my sister Shirley). Then Gary Chapman (Bass guitar) left and moved to Darlington, at that time Rob Hull (from Sedgefield) joined to play bass guitar (a top class bass player). When the Beatles and the Rolling Stones ‘happened’, myself and many other people I have spoken to all over the Northeast reckoned this was the DJays’ finest time, Brent and Johnny’s perfect harmonizing voices, Dennis’s lead guitar, Brian’s solid drum beat, and Rob’s bass playing suited the Beatles and Stones songs of the time. Every dance hall, workingman club, and community hall that we went to were full of DJays fans, some of them would travel miles to see the band. I always remember one girl at Glenholme boys club Crook saying if she could have an autograph she would teach Brent and Johnny the “correct” way to pronounce the French words in the Beatles song “Michelle”. Now as I travel to my work, in places were the DJays played people still remember them fondly. After the Djays, Brent started his own band called Chippo, Johnny had a solo singing career, Rob Hull went to university and joined a band called Chicken shack, Dennis, Brian and Raymond started their own businesses within the Trimdons. I am currently working in a studio with another good young local band (Durham and Peterlee) called Ambershift who are recording their first album “Chinatown”. It is mine and many others opinion that, had the DJays had the money, resources and opportunity to record locally (as Ambershift have) they would without doubt have been one of England’s top bands. I consider it a privilege to have known The DJays.